My webinar with KuppingerCole on the topic “Identity Services and the Cloud: What Every Enterprise Should Know” went pretty well yesterday. KuppingerCole has made the recording available for viewing, which you can download here (you have to register for a free account; trust me, its worth it). Or you can just check out the deck I presented. It started off with Martin Kuppinger talking about his views on cloud computing and identity management. I then spoke for about half an hour on how I think cloud computing will disrupt traditional enterprise identity management – but in a good way. More than anything else, cloud computing is going to accelerate the evolution of identity management to a services-based model. I have, of course, been talking about identity services on this blog and at OpenWorld and other forums for quite a while now. But the need for good security and controls in the completely elastic, plug-and-play world of the cloud mandates that identity be externalized into an infrastructure layer. I wish we had left more time for questions during the webinar, because I would have loved to hear from folks about their thoughts on the topic. Hopefully there will be a chance for discussion when I speak on this at Oracle OpenWorld (session details below). In the meantime, check out the webinar recording or my deck. And as always, I encourage you to leave me some comments. 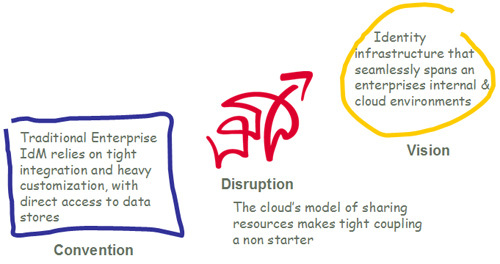 Identity Management and the Cloud: Stormy Days Ahead?